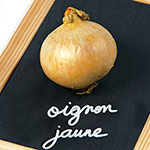 This sweet onion from the Cévennes has a satiny outer skin and is known for its tender texture and delicate flavour. Raw, it is surprisingly mild. Cooked, it has a sweet flavour. 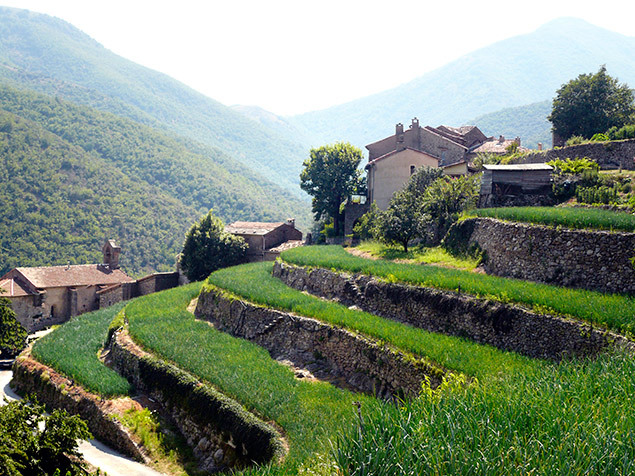 It is grown on terraces, a unique environment: a dry climate but with the acid sandy soil regularly watered. “Oignon doux des Cévennes” is rewarded by the french award : “AOC : Appellation d’Origine Contrôlée” (PDO : Protected Designation of Origin). It is produced according to a very strict specification. Grading is extremely rigorous, guaranteeing a homogenous product. > In nets (500g and 1kg) and in 10 kg boxes. 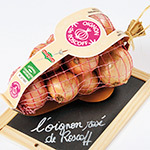 Roscoff onions are known for their coppery pink colour and fruity aroma. 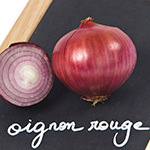 The region where this onion is grown, its reputation, the expertise of its growers and its taste qualities were rewarded by the award of a PDO (Protected Designation og Origin) in 2009. > Available in bunches or 5 kg bags. 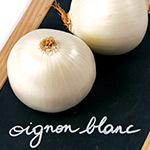 White onions are known for their juicy texture and crunchiness. We source these onions from Spain, Argentina and Mexico. Red onions are the most sweet. They are most often eaten raw and enjoyed for their crisp and juicy texture and red colour, adding a bright touch to salads. Depending on the season, we source this onion from Italy, the Netherlands or Spain. Yellow onions, the most familiar of all, are ready early in the season and very productive. We supply the traditional French yellow onion, and others imported from elsewhere in Europe, the Netherlands and Italy in particular. > In a range of packagings : 5, 10 or 25 kg bags and 10 kg boxes. 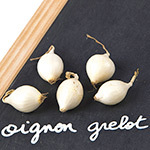 Pearl onions are tiny yellow or white onions. They are eaten raw, cooked as a garnish, used in preserves or pickled in vinegar. We source these onions from Italy or the Netherlands. Available in 250 or 500 g nets or in 5 kg bags. Growing of Cévennes PDO sweet onions at Taleyrac.